The property is furnished to a very high standard. It comprises of 1 bedroom at the rear of the property with a super king sized bed, a bedroom at the side of the bungalow with a 4 foot double bed. At the front of the bungalow, overlooking the Solent, is a twin bedroom . The study, also facing the sea, has a sofa bed which can sleep two additional people if required. There is a modern bathroom with bath and shower. There is also a modern shower room with toilet. The kitchen is fully equipped and has sea views. The spacious lounge has amazing sea views from a large picture window to the front with views of Southampton Water and a large bay window with views all the way across the Solent to Portsmouth. There is a separate study / TV room with a sofa bed. This also has fantastic sea views. There is also a conservatory with dining table which overlooks the mature spacious garden. The resident red squirrels visit most days. There is a secluded patio overlooking the garden which is a sun trap. The patio to the front has a BBQ and sea views. A travel cot and high chair is available. There is off road parking for 2 cars up a steep drive. Alternatively there is on road parking outside the bungalow. Once at the top of the drive the bungalow is on the level with only a small step up into the bungalow itself. From the rear garden there is a gate into Northwood Park. There are large gardens here, tennis courts, bowling green and children's play area. Parkwater is our family holiday home and has a very relaxing feel about it. It is extremely comfortable inside and the views are to die for. You could easily spend a whole week here just watching the boats sail by the window and lounging in the garden. Cowes is just a five minute stroll away. Both bathrooms are modern and have recently been refurbished. 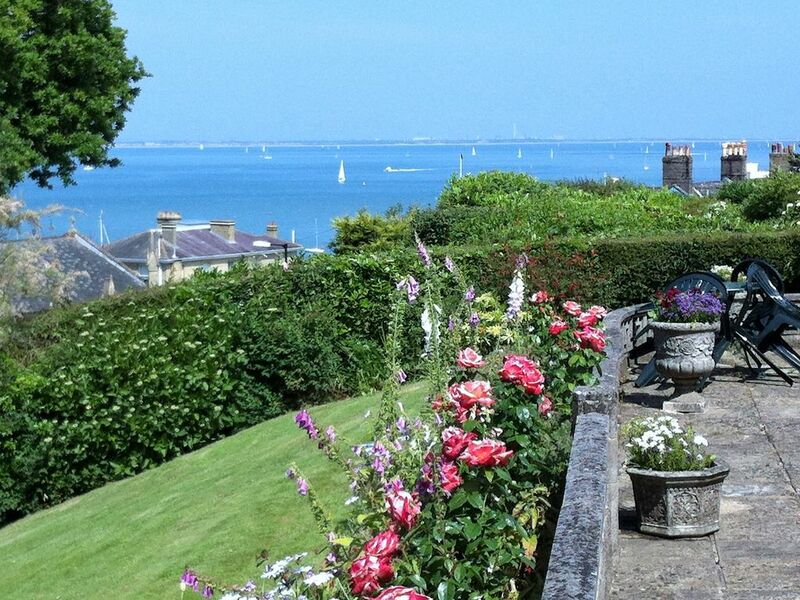 There is a terrace to the front of the bungalow with superb views of the Solent and southampton Water. Magnificent garden to the rear with sun terrace. Private entrance to Northwood Park which has an historical house and gardens, bowling green, tennis courts, putting green and children's playing area. There is space for parking two cars at the top of a steep drive. Alternatively there is on road parking outside the bungalow. We had the most wonderful stay at this property, it’s a real home from home, every window you look out of has the most amazing view be it the sea or the beautiful garden. We have stayed in many holiday houses and this one far exceeds the others. The bungalow is in the most stunning setting. The views are breathtaking . The property is immaculate and like a home from home. The owners are fabulous and friendly , prepared to help with anything at all. A very well equipped, warm and comfortable bungalow. We enjoyed a great Xmas with family at Parkwater. I wouldn't hesitate to recommend this property. Loved our first visit to the IOW, helped greatly by the beautiful location and quality of this superb bungalow. After traveling around the island we felt that West Cowes was the best place to stay. With easy access to the rest of the island, you can walk to all the bars and restaurants in the town. The quality of the food in all the restaurants we ate were of a very high standard. We would definitely return to this lovely place. The house is very well positioned on Baring Road, only 10 mins walk from the centre of Cowes so very easy to walk down to and back from where all the action is. It's a very well appointed property with lovely gardens, all well maintained. There is a good siza patio and BBQ/dining area at the front overlooking the Solent. We also enjoyed breakfast in the living room where you can also enjoy great views through windows. It's in a super position for days out all over the IOW, easy to get to/from lots of popular destinations. We would strongly recommend this property. Stunning views, beautiful garden, well equipped home in very convenient location. Wish to return next year. The Isle of Wight is the perfect place to enjoy a relaxing break, at any time of the year. It is a stunning Island with unspoiled scenery and a wealth of fascinating attractions. For the energetic, there are plenty of activities to enjoy, including walking, cycling and sailing. With over half of the Island is designated as an Area of Outstanding Natural Beauty and a network of footpaths that stretches over 500 miles it's easy to get close to nature. Alternatively, if you are looking for somewhere to be spoilt then indulge in the Isle of wight's fine restaurants, art galleries and historic houses. West Cowes, where the bungalow is situated, is the heart of sailing with yacht races starting from the Royal Yacht Squadron which can be seen from the bungalow.